This week’s infographic, created by Seattle University’s Project on Family Homelessness, focuses on adverse childhood experiences (ACEs) and their relation to adult homelessness. The project is based out of the university’s Center for Strategic Communications, and focuses on spreading awareness about the causes of family homelessness, as well as potential solutions to the problem. The term ACE is used to refer to potentially traumatic events that can have lasting negative effects on health and wellbeing. Examples of ACEs include emotional abuse, emotional neglect, household mental illness, parental separation and household substance abuse. It should be established that many ACEs are strongly interrelated. One study from California found that if a person had one ACE, the likelihood of having another was 2 to 18 times higher than those with no ACEs. The infographic states that as ACEs accumulate, there is an increased likelihood of struggling with adult homelessness. 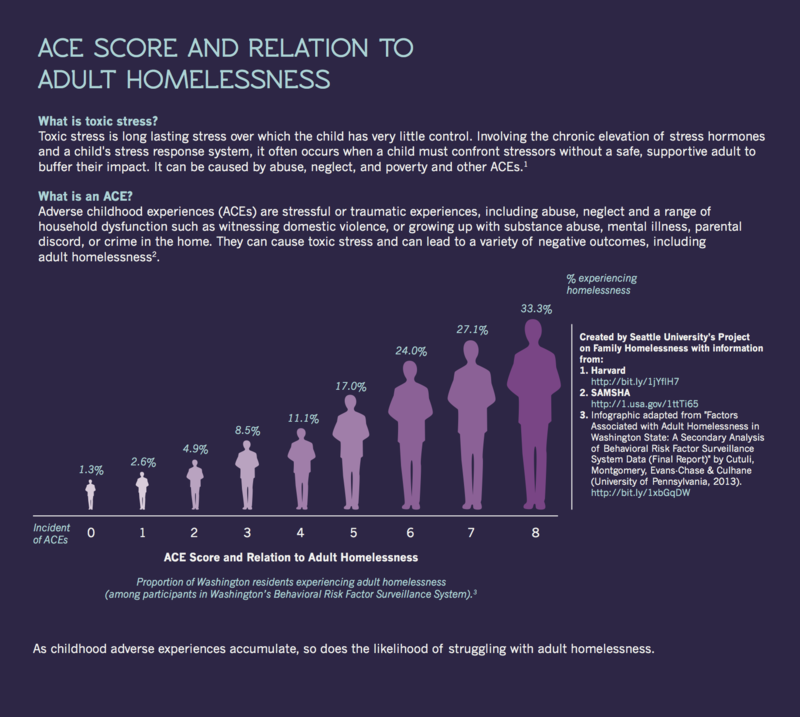 It is important to note that a gradient can be observed, there is an almost directly proportional risk of experiencing homelessness as an adult as the number of ACEs increase. Data reported in the study comes from a report published out of the University of Pennsylvania that looked at factors associated with adult homelessness in Washington State. Homelessness is just one of many negative outcomes that correspond with an increase in ACEs. Strong correlations have been observed between increase in ACEs and physical outcomes, including contracting cancer, becoming diabetic and becoming severely obese. Strong correlations have also been observed for mental health outcomes, including anxiety disorders, depression and antisocial behaviour. There is clear evidence that links ACEs and the risk of experiencing homelessness. The knowledge on ACEs can be used in the development of strategic programs that target homelessness from a prevention-based perspective. These programs can be understood as a means to protecting youth from the serious dangers that come with living on the streets, before they get there. Preventive approaches to youth homelessness have seen measured success abroad. An example of such a program is respite accommodation, which can provide youth with safe high quality accommodation when they may be fleeing family conflict. A recent evaluation of such a program in Birmingham (England) found that almost 80% of youth who used respite accommodation services returned home after two weeks. Another great initiative by the Center for Strategic Communications at Seattle University brought together local filmmakers, students, staff and community partners to tell the stories of families who were homelessness, or on the brink of becoming homeless. The project serves as a reminder of the powerful role of film and the creative arts in telling the stories of society’s most vulnerable. I invite you to watch the following short film, The Beast Inside, one of four videos produced by this project.